Place the butter and sugar in a bowl, mix using the whisk on a hand mixer. Add the eggs one at a time and continue to beat until the mixture becomes lighter in colour. Break open the cardamom pods, remove the pods, finely crush the seeds using a mortar and pestle, mix with the almonds and all the other ingredients up to and including the salt. Mix the lemon zest, lemon juice, rose water and almond mixture into the egg mixture, transfer the batter to the prepared tin. Approx. 45 mins. in the lower half of an oven preheated to 160°C. Remove from the oven, place on a cooling rack. Heat the lemon juice, rose water and sugar in a small pan, stirring until the sugar has dissolved. Prick the cake several times with a wooden skewer, drizzle with the warm syrup, leave to cool in the tin. Remove the cake from the tin. 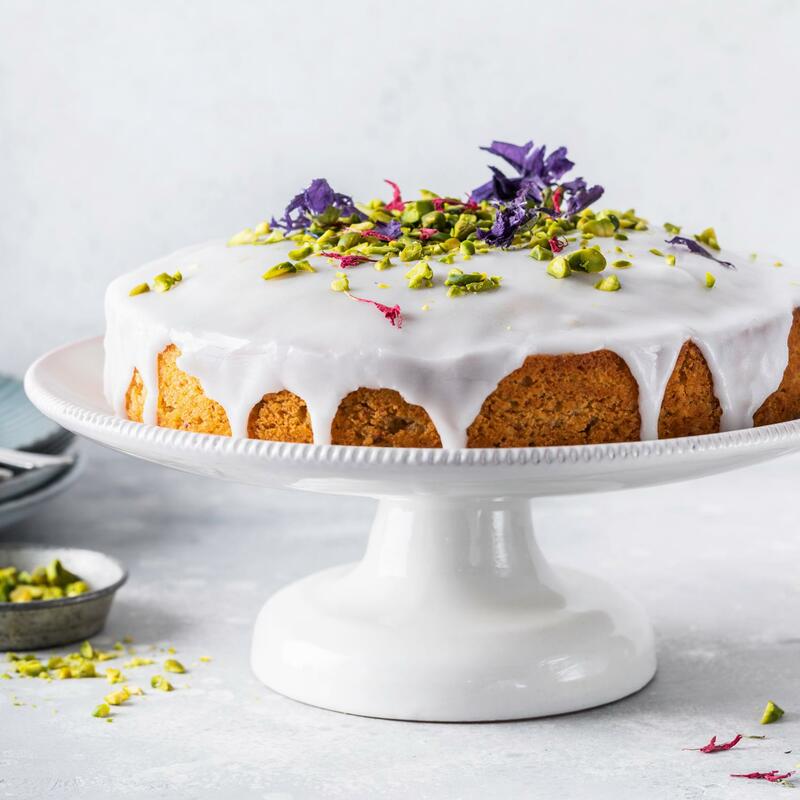 In a bowl, combine the icing sugar and water with the reserved lemon juice to make a thick icing, spread on top of the cake, top with the pistachios, leave to dry. Scatter 2 tsp of edible flowers over the cake along with the pistachios.